After you select a Word document, software will show a default output folder, you can use "Browse" button to choice another place. The default JPEG compression quality is 90%, you can set another value from 30% to 100% (almost no loss) as you need, this value is more higher, and output image will be more bigger and more clearer. This software need a compatible version of Microsoft Office Word installed on your computer, it have tested with Word 2013 under Windows 8, and it should can work with Word 2007, 2010, 2013 and later version. Moreover, software need .NET Framework. 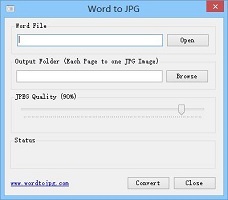 Microsoft Office Word is very popular office software, but users are unable to directly save documents as pictures, how to convert Word to JPEG? previously, users need take many screenshots, and stitch these screenshots one by one, it is very inconvenient. 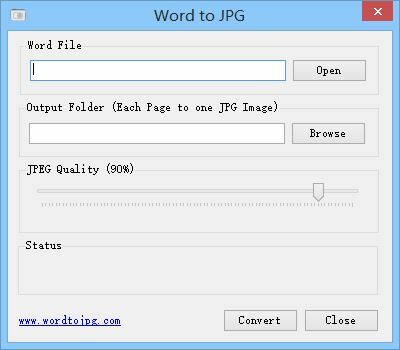 Now let this small software help you, as its name suggests, it can quickly convert Word to JPG/JPEG images in a few mouse-clicks. At the best, it is a completely freeware. JPG/JPEG image format is the most popular image format, you can easily use these images in other places, such as e-mail attachments, share or post in the Internet, or browse it on your mobile phones and more. This small software will be a good utility for you on your PC desktop. Copyright © www.wordtojpg.com, All Rights Reserved.